This well established hotel and apartments offer guests a family holiday base with a vibrant, informal atmosphere on a half board or self catering basis. The complex enjoys a central location with a good range of shops, bars and restaurants nearby. Did a 5 day break here at the start of September. Check in was a bit chaotic as there was a queue, but after a quick ciggie I was dealt with very efficiently. Room was ok, overlooking the lower pool – but was the last room in a long corridor. I never heard any noise from anywhere else in the hotel. Tv/aircon/etc all worked. English channels were bbc world news, cnn news, eurosport and another news channel. Hair dryer in bathroom was quite powerful. Room had double bed, but would have been very cramped if another bed was put in the room. 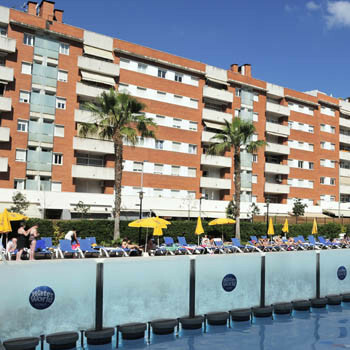 2 pools and a kids pool with plenty sunbeds –maybe it is just during the school holidays that they have to queue. Food was ok. The standard Spanish buffet menu. I did not see anything special about it but again it was well cooked/presented and there was sufficient choice. My only real complaint was that they roped off a fair bit of the dining room (almost certainly because they were not full), which made it a bit of a pain trying to find a table. They have waiter service for drinks at dinner with wine at some silly prices and “aqua con gaz” at €1.70. I did notice some of the entertainment, as there always seemed to be quite a crowd for the shows, and the performing poodles is worth seeing. However, the majority of the entertainment is geared more to ABE (Anybody But English). I got a very good deal for this – through Thomson on hotel only – so I was not unhappy with my break. I am booked in again at the end of the month –again through Thomson –and have no worries about going back. For what I paid I felt I got good value for money. This is a sister hotel to the Aquarium, which is next door; both being 4*. However I don’t think this hotel is a patch on the Aquarium. Went on this holiday has it was a 2hr fight and mainland spain being close has had a 7 mth baby . Arrived at the hotel with no cot in room and told to put baby in with son told them i wasnot doing that and got a cot the next day. Pool area was nice but a fight for the beds which people keep all day. Food was really nasty if you like fish you are okay breakfast wasnot to bad you can wait upto 45mins for a table. Ate out most nights, big queues for the food with people jumping in front off you with no manners at all. The hotel is very international. The hotel entertainment was really bad hardly any english so didnot understand much of what was being said. It's very expensive there to buy stuff know the euro as taken over. I would not go back to llorett de mar or to this hotel. I wanted to come home the secound night. Good points the rooms are kept clean and pool. We had to be out our room for 10am and our flight was not till 6 the next morn coach was picking usa up at 2.30 asked to have a late check out 6 times and was just told its August fully booked didnot even look on the computer to see, and no one was in the room all day till we went. I will stick to my island holidays. We found this hotel very clean. The food was really good...plenty of it and lots of choice. The location was 10 minutes from Fenals Beach and we easily walked to Lloret town and beach. The staff we found exceptionally friendly and most helpful. Hotel was a mixture of nationalities. Would certainly visit it again. Stayed at Oasis Park for 1 week. Spotlessly clean, pool area great for kids and in an excellent location, only about ten mins walk to lovely beach. The food catered for all tastes and everything we ate was good in fact came back needing to diet. The staff were friendly and adored my little girl whose five. Entertainment was typical abroad rubbish parrot show, flamenco dancers and the usual kids repetetive dances but we still enjoyed. This hotel does look nice but not the 4 star I expected more like a 3. Food not brilliant with a bit of a stampede at opening time. Rooms clean but not that big if there is 3 or more of you. Location good in between Lloret and Fannals. I will not visit this hotel again but I am glad I went and I did enjoy it which was due to being with my family. We recently stayed at the Oasis Park and I've decided to write a review. The hotel is positioned in the Fenals area of Lloret and is just a 10 minute walk into Lloret or right on the doorstep of Fenals. The beach in Fenals is again just 10mins away but the beach in Lloret is a good 25 mins walk at least. When we arrived at the hotel there was approx 15 people of the coach and 8 of these were in a party together. We were told to return at 1pm for the key to the room as it was 10.30 normally this would not bother us but when we arrived at the desk the receptionist took one look at us saw we were young, presumed we wouldn't complain and told the person who was giving us the key to swap it with another room as we were young we wouldn't complain (good job I speak Spanish hey!!! ). By this point I was tired and in need of a drink so I didn't say a word and went to the bar. I then watched every person from the coach be out into rooms straight away and 3 bus loads of foreign guests. At 1pm I returned for the key and was told the room still wasn't ready and that we would have to wait till 3!!!! At this point I asked to see the manager and amazingly a room was found. As a ex-rep I know this sometimes does happen so I decided not to judge my holiday on this. The rooms are lovely for a 3/4star hotel and have everything that you could possibly need, just try and get one poolside as we did there is a lot better view and less noise. The bar area is very basic and I would not recommend the entertainment for anyone under the age of 55 as it was very old fashioned. There are only 2 bad points I can think of that would not make me return to this hotel. Firstly the reception staff are very rude and unprofessional especially to British guests. In fact I would say that they ignore British guests and favour other nationalities. Secondly and the major point is the food. Over a week holiday we only ate there once, the reason for this was that the food was not up to the standard of a 2 star. There was very little choice in fact I would go as far as saying that there was no choice. The food was cold, the meat raw and very badly planned. I cannot comment about the breakfast as after the first time we went in the restaurant we refused to go back and would rather pay to eat out. I have stayed in a variety of hotels as a guest from 1 star Greek to 5 star American and Caribbean AI. I have also worked in and eaten in hotels all over the world as i worked for a holiday company, even one that served sprouts up with breakfast but this was by far the worst. Looking back I would recommend this hotel to someone on a selfcatering package who would be spending most of the time out and about but if your planning on going half-board look elsewhere. If thinking of this Hotel, do not book half board. We have holidayed enough to know that the food is not piping hot but unless you went to the dining room as soon as the doors opened (which we only discovered on our last night there) the food was nearly always cold and not particularly good. There may have been the usual salad, pork, fish etc. As usual catering mainly for non-British and we usually are not fussy and eat anything but even we could not eat cold food every night. My advice is to go down as soon as the dining room opens in the evening - on the dot. There was also the problem of trying to find a "cleared" table. On many nights we had to sit down to our meal with the previous occupants leftovers still on our table. Definitely not enough staff. Also if you go first thing you wont be trampled to death. After 8 it is absolute bedlam, we thought there was a food shortage and no one had told us about it. Most of the foreign guests pushed and shoved, the usual queue jumping. Dining room too tightly packed with tables, no one could eat their meal without getting "bumped" every so often, no matter where you sat. Hotel please note MARK THE FOOD - fed up having to guess what we were eating unless of course it was salad or cake which there was plenty of. Very cheap way to feed your guests. We were forced to eat out a few times just for the enjoyment of eating our meal in peace and having something different. Bar staff were great, very friendly, don't know how they do it - must be on autopilot. Our room spotless at all times, towels changed every day, no probs there. Sound proofing is a big problem in this Hotel, unless you whispered, either side of you could hear every word. Unfortunately, we had 3 very loud French lads next door coming in every morning at 5.30 after a night on the town and continued partying until they flaked out around 7.30 a.m. slept for the day and started again around 4.00 p.m. - so no sitting on our balcony or having a wee lie down in our room. Did complain after 3 days (along with other people) and although reception said the lads had been spoken too it did not make a difference. Mind you they did ask "was it just talking" or was it "shouting" so gather this is a regular complaint. Pool area/snack bar/terrace spotless and was happy to see lifeguards on duty all the time. We were unfortunate enough to have a flood from the ceiling in the bathroom (3 times before fixed)can't believe a 4* does not have maintenance men on site, the first downpour was 7.30 in the evening. Our view would be more like 2*/3* hi de hi holiday camp. p.s. only one plug in room. We are two couples in our early 60s. Steve & Caroline (previous report)have it about right but here is my tuppence worth. The hotel is L shaped so do not let yourself get allocated a room in the apex of the L as these are next to the lifts and service ducting hence noise most of the time from marble floors, water / drainage system and lifts. Jacuzzi is available for a pre bookable fee (returnable after session) of 5 euro but it is quite a severe jacuzzi and needs turning down a tad. The food was geared to Spanish & French who seemed to be in the majority especially at week ends so no surprises there, house wine is 6 euro a bottle and not bad. We used the Tandoori Nights opp the hotel, pricey but good on a few ocassions just for a change of diet although I think the breakfast fare was quite good in the hotel. Like all hotels the internet is expensive so use the internet cafe along from the hotel as its only 1/4 of the price. Bus stops are handy, the L2 is a circular one way only which goes around the Llorette area every 15 mins for .90 and terminates at side of hotel, last one at 21.15. The L1 can be caught outside the large supermarket over the block from the hotel on the main road, this bus will take you to Blanes for 1.20, if you want Blanes railway station to go to Barca get the "estation" bus.The hotel does run trips to Barcelonas home games but at 90 euro its a bit steep. A little tip, a small fridge can be hired from reception for 15 euro a week but when you remove the swipe card to go out as it also locks the door the fridge goes off till you return and put the card back into the slot to turn elec back on so listen to this, your MATALAN card will keep the elec on but dont let maid see it as she will remove it. We arrived at Oasis Park in the early hours of the morning, tired and stressed from the flight and coach during, however we were dealt with very quickly at the reception with the man that was on duty that night. He spoke very good English and had us checked in and directions to our room within 5 minutes. Our room itself was fine, 2 single beds, tv, balcony (with pool view as we requested), air conditioning and a separate bathroom. We were very impressed with how clean our rooms were and the air conditioning made it very comfortable. The maids cleaned the rooms every day and left clean towels everyday and our bed clothes were changed twice in the week we stayed. All-in-all we could not complain about our rooms. Likewise the rest of the hotel was very clean and the pool and surrounding areas were spotless. Also there was plenty of sun beds to accomodate the amount of people staying there during the time we were. Being half board we were not satisfied with the food at all. Very biased towards the Spanish, French and Germans with lots of cold meats and cheese, the British were left with soggie chips or plain pasta. Also the dining hours did not suit alot of people including ourselves. Breakfast was between 8am and 9:15am, which even if you hadn't been out on the town the night before was hard to make. Evening meal wasn't too bad, served between 7pm and 9pm. We ate in the hotel only twice and ate out every other night. Hotel location was excellent, quiet and out of the town however 10 minute walk had you to the best nightlife and shops. Surrounding the hotel there is plenty of shops and restaurants. Hotel bar staff were excellent, very friendly and spoke great english. There was plently on so you never had to wait for a drink, they were great fun. Reception staff however weren't so helpful or friendly. Entertainment was ok, we only saw a couple of the entertainment nights when we were having a few drinks in the hotel so I cant really comment on this aspect. All-in-all we had an excellent holiday and are considering booking this hotel again for next year, however we will try for self catering this time. We would definately recommend this hotel to friends and family.